Home / Dr. Sylvia Ramirez / What is Jowling? And How Do I Treat It? As collagen breaks down over time your skin becomes thinner and less elastic resulting to sagging skin on the jawline. 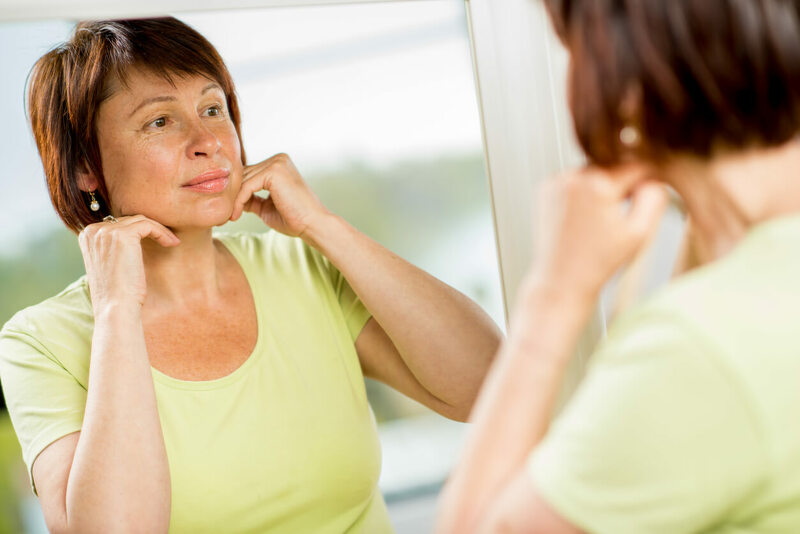 Jowling or the excess skin on the lower face (just below the chin and jawline), is something that almost everyone develops with age. Jowls are mostly caused by the loss of elastin and collagen. The absence of these proteins can make the skin surrounding your mouth lose both its tightness and firmness. Gravity also plays a part, which can cause the skin to sag and droop down to the area on the side of your chin or mouth. This is also the reason why sagging jowls sometimes create the look of a double chin for some people. If you want to get rid of sagging jowls, surgery is not your only option. Aesthetic clinics in Singapore offer non-invasive and minimally invasive treatments that can lift your neck without going under the knife. Ultherapy is an FDA-cleared innovative skin tightening treatment that can lift and correct sagging jowls from within. It uses time-test focused ultrasound energy that penetrates deep in the layers of the skin to trigger new collagen production. This leads to visible tightening over time, which can help you achieve a more youthful look. With just a single treatment, Ultherapy can fight the many signs of aging. Depending on the area of concern, the treatment can take between 30 and 120 minutes. A lower face and full neck treatment can take 90 minutes, while a full face and neck treatment last for 120 minutes. While most can benefit from a single treatment, you can opt of additional treatments to maintain better results. You can expect to see significant results over two to three months, as this is the time where the new collagen begins to lift and tighten the skin. You can see further improvements six months after the procedure. As the treatment is non-surgical, there are no special skincare regimens and preparations required before the procedure. This makes it a great alternative for those who are not yet ready for cosmetic surgery and those who wish to extend the effects of surgery. There is also no downtime, so you can return to your normal routine after the procedure. Exilis is an FDA-cleared aesthetic device that simultaneously uses radiofrequency and ultrasound energy to tighten the skin and promote collagen production. Exilis can reach the deeper layers of the skin to tighten your neck and smooth out your skin. The best part about this procedure is that it can give you total face and body rejuvenation without going under the knife. It involves the use of a handle device with two sizes of applicators: small and big. The small applicator is for the smaller areas of concern like the face and neck, while the big applicator is for body areas like the hands and arms. It can offer significant result without the extensive recovery period associated with surgery. This also means that there is no down time or side effects. You may see results after four treatments, but significant improvements are likely after eight sessions. Do take note that this will still depend on your individual profile and skin laxity, so talking to an experienced aesthetic doctor in Singapore is advisable. PDO thread lift is a minimally invasive treatment that can lift and tighten sagging skin. It is safe and effective in lifting the cheeks, neck, lower face, and jowls. At Cutis Laser Clinics, we use Dr. Perfect V-Line threads, which are both KDFA and CE marked. These are made of 100% absorbable PDO (Polydioxanone) threads that are inserted in to the skin using fine needles and cannula. PDO has been long used in medicine (mainly in surgery) and been shown to stimulate new collagen production and synthesis of elastin and hyaluronic acid. Both of these are essential in keeping the face skin looking youthful and plump. You may be able to see visible effects after two to three weeks, but significant improvements are seen after two to three months. It is also good to know that newer and stronger threads like 4D and Multi-threads are available to give you better results. These threads are suitable for sagging cheeks, lower face, and double chin. Local anesthetic may be required, but there is no hospital stay needed, as the threads offer quick recovery with visible and natural results. The PDO threads are naturally absorbed by the body for about six to eight months, but their effect can last for about two years as the body begins to produce new collagen around each thread. Do take note that the results vary from every patient, but they can give you a refreshed and rejuvenated look. Don’t let sagging jowls give away your age. If you are bothered with the skin in your lower face and neck, consider any of these non-surgical treatments. Contact Cutis Laser Clinics today and schedule a consultation with our Harvard-trained aesthetic doctor, Dr. Sylvia Ramirez, to learn more about these treatments and make an informed decision about your face and body concerns.